Hot forging simulation has gained special attention in finite element modelling of thermal processes due to its high importance among manufacturing processes. During the last two decades, there has been very intense research activity in the field of finite element simulation in metal forming processes; among them, hot forming has gained special attention. • Complicated temperature evolution is characteristic for these processes, therefore, thermal and mechanical coupling should be considered. • Usually, severe, large deformations occur. • Contact phenomena and friction play a significant role. • Significant microstructure changes of the parts occur, which have significant effects on the final properties (e.g. the mechanical properties, etc.). • Development of adequate process sequence and die design by process simulation of die cavity filling, predicting temperature distribution so that part properties, friction conditions, and die wear can be controlled. 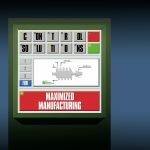 • Increasing part complexity and process economy by maintaining or reducing manufacturing costs, reducing die try-outs and lead times, reducing rejects, etc. • Improving part quality by predicting process limits that should not be exceeded in order to avoid internal and surface defects and improving material flow, grain flow and microstructure changes. • Selecting the appropriate forging machines for the given applications. While forging is a process with many centuries of history, its theoretical basis is a relatively young science; however, it is of utmost importance to the understanding of the process itself and to the development and application of finite element modelling. Various useful methods and techniques were developed to analyze metal forming processes: the slab method, the slip-line technique, and the various upper bound methods are very useful for predicting forming loads, overall geometry changes, etc. but accurate determination of the effects of various process parameters and detailed material flow analysis have also become possible by developing finite element procedures to metal forming processes. Although linear-elastic FEM analysis was already successfully used as a powerful structural analysis tool many decades ago, non-linear finite element analysis had serious problems at the beginning due to its heavy computing need and the lack of sufficient computer power. The application of finite element method to metal forming problems began as an extension of structural analysis technique to the plastic deformation . Since in metal forming processes, the plastic strain significantly outweighs the elastic strain, in many cases the rigid-plastic or rigid-viscoplastic material behavior is acceptable. The resulting analysis based on this assumption is known as the flow formulation . However, in many applications, elastic strains cannot be neglected: therefore, in these applications, the so-called solid formulation based plastic stress-strain matrix developed from the Prandtl-Reuss equations was used . In this analysis, the material is considered as elastic-plastic, or elastic-viscoplastic. One of the most important steps in the simulation of metal forming processes was the inclusion of the effects of strain-rate and temperature in material properties and the thermal coupling in forming solution . This was that development which made possible the extension of finite element analysis towards warm and hot forming processes . A further important step was the development of process-oriented special purpose FEM codes  that are nowadays widely available in the market. By the 1990s, with the enhancement of computing power, plasticity-based finite element methods had gained sufficient ground to result in the emergence of several forging specific simulation packages. The user interface of these packages is continuously improved to make their industrial application more user-friendly. 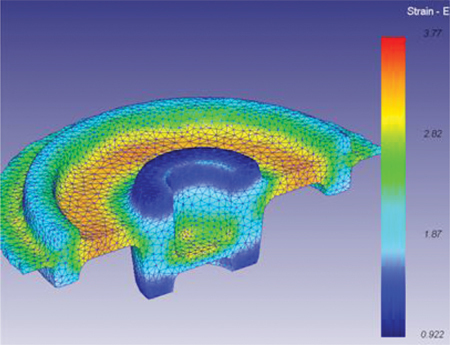 The sophistication of commercially available simulation tools is such that by modelling the elastic and thermal dimensional changes of both the part and the tools, it is possible to improve the precision of the forging process leading to near net shape products and a reduction in wastage of workpiece material. 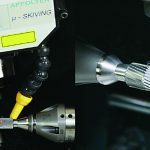 The ability to achieve close proximity to net shape so as to enable single pass machining or even grinding is currently quite realistic for parts that can be simulated. Also, powerful as they are, simulation tools do not displace the need for a traditional tool design capability. Simulation can only simulate a pre-conceived tool design. Nowadays, various commercial forging simulation packages are available. Among them the most widely applied are the following ones: DEFORM, MARC AutoForge, MSC SuperForge, Forge 2 and 3, QForm, etc. They variously enable the simulation of cogging, rolling, forging, ring rolling, extrusion, piercing and many of them are associated with heating and cooling processes. The forging equipment definitions incorporated within the packages include hydraulic presses, mechanical presses, screw presses, drop hammers or any other machine characteristics that can be defined by the user. • What effect could the development of simulation tools have on the forging industry? • How realistic and effective is their implementation under industrial circumstances? A typical response is that the application of simulation tools will result in a reduction in lead-time. 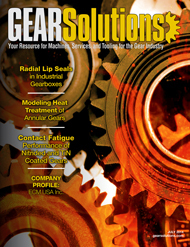 Lead-time is often dominated by tool manufacture and set-up time. 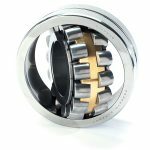 The real benefit in production terms is more likely to come from the enhanced speed of quotation preparation, reductions in tool trials and hence lead-times, or in product development terms by increasing confidence in the ability to extend the product range. 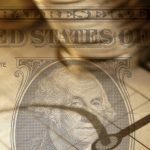 A further “business benefit” arises from the enablement of a quality assurance aspect of simulation. 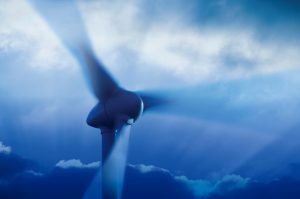 A potential supplier can now offer simulation output as evidence that the proposed die design is feasible and then gives assurance of anticipated satisfactory delivery. where is the volumetric strain rate, is the effective stress, is effective strain and is the effective strain rate, p is the pressure, V is the volume and S is the surface of the deforming workpiece, respectively. where k is the thermal conductivity, T is the temperature, p is the density, c is the specific heat, α is the fraction of deformation energy that converts into heat, and qn is the heat flux normal to the boundary, including heat loss to the environment and friction heat between two contacting objects. By applying the FEM discretization procedure, Eq. (3) can also be converted to a system of algebraic equations and solved by a standard method. 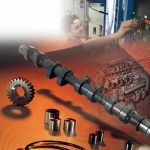 In practice, the solutions of mechanical and thermal problems are coupled in a staggered manner. After the nodal velocities are solved at a given time step, the deformed configuration can be obtained by updating the nodal coordinates . 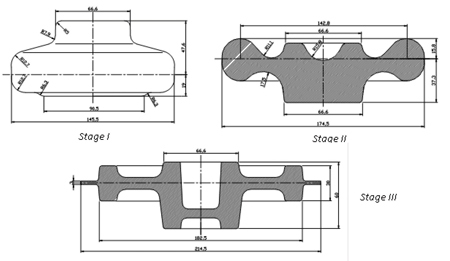 • How do you discretize the deforming workpiece? • What is the most efficient solving method available? • How do you reduce the memory requirement in solving equations? 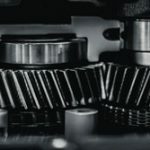 Many considerations are arising and many selections are changing as both the computational methodology and the computing technology evolves. Some of the most important issues will be shortly summarized here. In finite element modelling, the real material behaviour is of utmost importance to facilitate the analysis. In order to accurately predict the metal flow and forming loads, it is necessary to have reliable input data. For many bulk forming problems, especially at elevated temperatures, which is the case in hot forming processes, the elastic deformation is often insignificant and therefore can be neglected, rigid–plastic material model (the flow stress is a function of strain and temperature) and rigid–viscoplastic material model (the flow stress is a function of strain, strain rate and temperature) are used widely due to their simplicity and fast convergence in iteration. 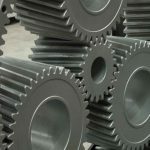 If residual stresses and/or spring-back are a primary concern, the elasto-plastic material model, which is generally characterized by an initial yield and strain hardening, is a better choice. The grain size is also an important parameter that governs the material behaviour. In order to represent the evolution of workpiece geometry, the updated Lagrangian method is often used. As a drawback of this method, however, that the elements degenerate easily when large deformation and drastic change in shape occur during the bulk forming process. In order to continue the analysis, a new mesh must be created out of the surface of the old mesh, known as remeshing or rezoning. It may be needed to perform many times before a complete forming process is simulated and hence has to be automated. The Eulerian formulation is more suitable for the steady-state processes such as extrusion and rolling. For a more efficient modelling of these processes, the code is being further developed to include the Arbitrary Lagrangian Eulerian (ALE) formulation. 1. Establishment of a preliminary die design and selection of process parameters by using experience based knowledge. 2. Verification of the initial design and process conditions using process modelling. 3. Modification of the die design and initial selection of process variables, as needed, based on the results of process simulation. 4. Completion of the die design phase and manufacturing of the dies. 5. Performing die try-outs on production equipment. 6. Modification of die design and process conditions, if necessary, to produce quality parts. The information flow corresponding to the above steps in process modelling is shown in Figure 1. The input of the geometric parameters process parameters, and material parameters set up a unique case of a closed-die forging. Modelling is then performed to provide information on the metal flow and thermo-mechanical history of the forging, the distribution of the state variables at any stage of the forging, and the equipment response during forging. The histories of the state variables, such as strain, strain rate, temperature, etc., are then input to the microstructure model for microstructural feature prediction. All of the information generated used for judging the forging operation. The non-satisfaction in any of these areas will require a new model with a set of modified process parameters until the satisfied results are obtained. Then, the optimum process is selected for shop practice. 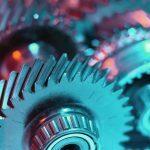 Process Modelling Parameters: The most important input parameters for forging process modelling are the geometric, the materials and process parameters. In the following, the types and importance of these input parameters are shortly discussed. Geometric parameters: The starting workpiece geometry and the die geometry need to be defined in a closed-die forging modelling. Depending on its complexity, a forging process can be simulated either as a two-dimensional, axisymmetric or plane-strain, or a three-dimensional problem. If the process involves multiple stations, the die geometry of each station needs to be provided. Material properties: In order to accurately predict the material flow and forming loads, it is necessary to use reliable input data. 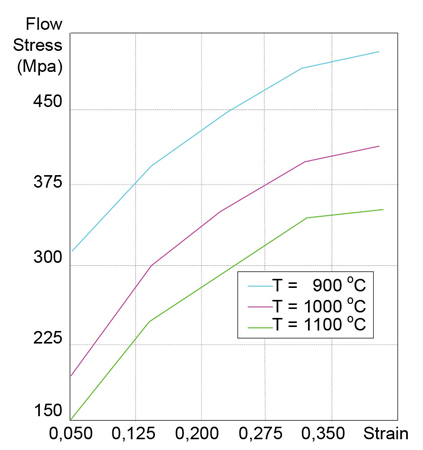 The stress-strain relation or flow curve is generally obtained from a compression test. In most simulations, the tools are considered rigid; thus, die deformation and stresses are neglected. 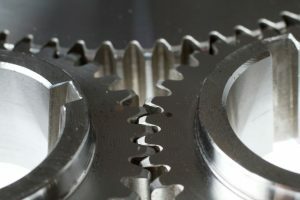 However, in precision forging operations, the relatively small elastic deformations of the dies may influence the thermal and mechanical loading conditions and the contact stress distribution at the die/workpiece interface. Thus, die stress analysis is a crucial part of process simulation to verify the die design and the forging process parameters. 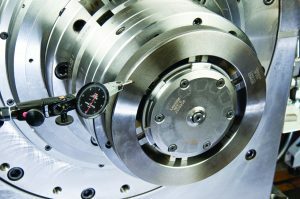 Interface conditions: The friction and heat-transfer conditions at the interface between the die and the billet have a significant effect on the metal flow and the loads required to produce the part. In forging simulations, due to the high contact stresses at the interface between the workpiece and the die, the constant shear friction factor gives better results than the Coulomb friction coefficient. The most common way to determine the constant shear friction factor in forging is the well-known ring compression test. 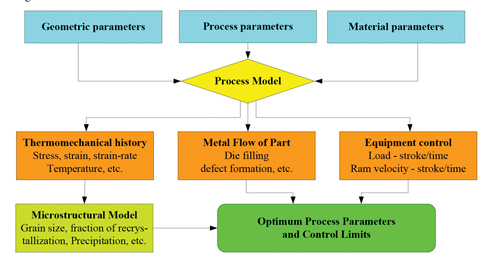 Process parameters: The typical process parameters to be considered in a closed-die forging include: the environment, the workpiece and the die temperatures, the coefficients of heat transfer between dies and the billet and the atmosphere, the time used to transfer the workpiece from the furnace to the dies, the time needed to have the workpiece resting on the bottom die, the workpiece and die interface heat-transfer coefficient during free resting, the workpiece and die interface heat-transfer coefficient during deformation, the workpiece and die interface friction, etc. The die velocity is also a very important parameter to be defined in the modelling of a closed-die forging. Process modelling of closed-die forging using finite-element modelling has been applied in forging industry for a couple of decades. 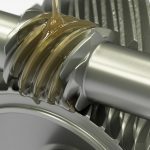 The goal of using computer modelling in closed-die forging is the rapid development of right-the-first-time processes and to enhance the performance of components through better process understanding and control. In its earlier application, process modelling helped die design engineers to preview the metal flow and possible defect formation in a forging. 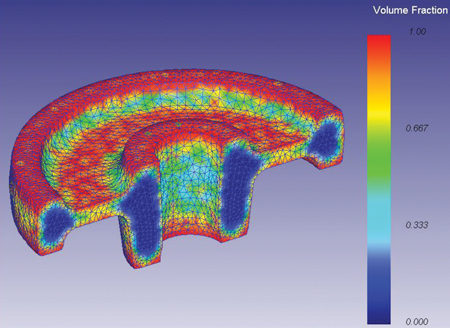 After the forging simulation is done, the contours of state variables, such as effective strain, effective strain rate, and temperature at any instant of time during a forging, can be generated. The thermo-mechanical histories of selected individual locations within a forging can also be tracked. These functions of process modelling provided an insight into the forging process that was not available in the old days. 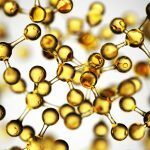 Integrated with the process modelling, microstructure modelling is a new area that has a bright future , . Microstructure modelling allows the optimum metallurgical features of the forging to be previewed on the computer. Metallurgical aspects of forging, such as grain size and precipitation can be predicted with reasonable accuracy. Some proven practical applications will be shortly described in the following parts. One of the main industrial application fields of forging simulation is the design of forging sequences in cold, warm, and hot forging, including the determination of preform shapes and dimensions with the prediction of material flow, the forming forces, die stresses, etc. In Figure 2, the final shape and dimensions of an annular gear to be produced by hot forging can be seen. Due to its complicated shape and strongly changing cross-sections, it is an excellent example for multi-stage hot forging simulations. Furthermore, due to its designation, it should be also heat-treated, which provides a further possibility to illustrate the integrated simulation of multi-stage hot forging and heat-treatment processes. The dimensions of the starting billet are calculated from the final shape and dimensions of the forged component using the volume constancy rule. The billet is made of plain carbon steel (C = 0.45 %) from a cylindrical bar with the dimensions: Ø 75 x 120 mm. In Figure 3, the process sequences of principal forging operations can be seen that are needed to produce the above annular gear component. The preform shapes and dimensions are determined on the basis of theoretical and practical considerations including a great amount of workshop experiences summarised in the book Design of Hot Forming Processes . In each stage, the volume constancy rule is applied, and the intermediate preform shapes are determined as to provide a smooth material flow with a continuous approximation of the final shape of the component. The third stage is followed by a burring operation removing the flash necessary during the preform operations. Finally, the cutting operation of the central hole is performed and the gearing is done by machining operation. 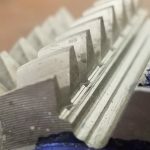 The heat-treatment of the component is done by hardening with subsequent tempering to get the prescribed hardness and other mechanical properties. The forming of the part is done on a National type hot forming press with a nominal capacity of 4000 tons and the stroke length of 250 mm. where is the effective true stress, is the effective true strain, is the effective strain-rate, n is the strain-hardening exponent, m is the strain-rate exponent, C, n, m and y are material constants. The flow curves for the applied material at the most relevant temperature ranges concerning the hot forming processes are shown in Figure 4. For the forging simulation, the surface of the tools was preheated to 3500C. During the simulations, the temperature distribution, the stress and strain state distribution was analysed. Due to the symmetry of the component, only the forging of a quarter of the part was modelled to reduce the time needed for the simulation. In Figure 5, the temperature distribution is shown at the end of the 1st, 2nd, and 3rd forging stages, together with the temperature scale. In this Figure, so-called global temperature scale is applied, i.e. the attached scale is valid for each forging stage. 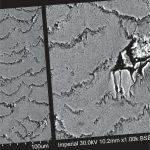 In these pictures as it can be seen in Figure 5, the temperature increase due to the absorbed deformation energy, as well as the cooling effect of the tools can be clearly observed. Thus, for example, in the first forging operation, the temperature maximum inside the preform attains 11600C degrees, as the highest temperature value during the whole forging process. As the contact surface of the part and the tool is increasing, the cooling effect of the forging tool is more significant. 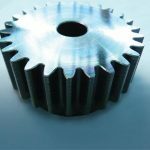 The lowest temperature at the end of the third forging stage is 6670C, which can be measured at the outer surface of the lower bush part of the annular gear. 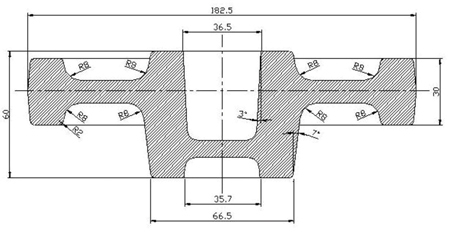 In Figure 6, the effective strain distribution of the forged annular gear at the end of the third forging operation is shown. As it can be seen, there are very significant differences in the value of effective strain: the lowest value is =0.922, whilst the highest one is right above =3.0, however, there is no any critical deformation causing failure. In Figure 7, the effective stress distribution of the forged annular gear at the end of the third forging operation can be seen, which shows quite acceptable stress values. After the forging simulation, the gear geometry was modified to take into account the flash removal and drilling operations. 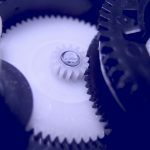 Then, the modified gear geometry was used to simulate the heat-treatment operation. 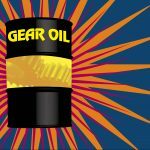 The gear was heated up to the austenitization temperature (T = 850oC) and cooled down in 60 seconds with oil quench. A time-temperature transformation diagram for the given material was used to follow the austenite to pearlite/bainite/martensite transformation. In the simulation package, various expressions are used to describe the phase transformations depending on the transformation kinetics. In Figure 8, the distribution of martensite phase is shown at the end of quenching. Besides the above examples, prediction and optimization of flash dimensions, prediction of die stresses, fracture, and die wear; improvement of process variables and die design to reduce the risk of possible die failure, or simulation of microstructure and properties, elastic recovery, and residual stresses are very important fields of industrial applications. In this paper, the numerical modelling of hot forging processes was overviewed. 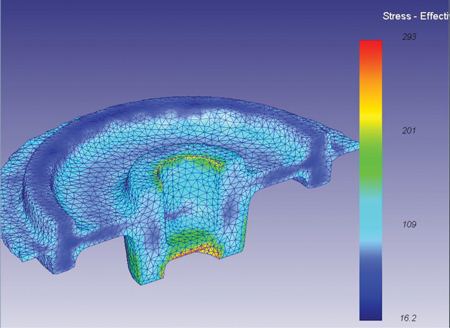 It was shown that hot forging simulation has gained special attention in finite element modelling of thermal processes due to its high importance among manufacturing processes, as well as due to its complicated nature concerning the coupled thermal and mechanical modelling and strongly non-linear physical and material behaviour during hot forging. It was also shown that finite element simulation can successfully applied in modelling of bulk forming processes to develop adequate process sequences and die design, die cavity filling, for predicting process limits, to improve part quality by avoiding internal and surface defects, and to increase part complexity. In hot forging processes, material flow, grain size and microstructure changes can also be simulated to reliably predict mechanical properties. Since hot forging processes are performed at elevated temperatures, the integrated forging and heat-treatment simulation is of special interest. This research work was performed as part of the TÁMOP-4.2.1.B-10/2/KONV-2010-0001 and TÁMOP-4.2.2.A-11/1/KONV-2012-0029 projects in the framework of the New Hungarian Development Plan. The project is supported by the European Union, and co-financed by the European Social Fund, which is gratefully acknowledged. 2. Kobayashi, S., Oh, S. and Altan, T. (1989) “Metal Forming and the Finite Element Method” Oxford University Press, Oxford-New York. 3. Zienkiewicz, O. C. (1984) “Flow formulations for numerical solutions of forming processes” John Wiley, New York. 4. Pitman, J. F. T. (1984) “Numerical Analysis of Forming Processes” John Wiley, New York. 5. Boër, C. R., Rebelo, N., Rystad, H. and Schröder, G. (1986) “Process Modelling in Metal Forming and Thermo-mechanical Treatment” Springer-Verlag, Berlin. 6. Altan, T. and Vasquez, V. (1996) “Numerical process simulation for tool and process design in bulk metal forming” Annals of the CIRP, Vol.45, No.2, pp. 599-610. 7. Bramley, A. N. and Mynors, D. J. (1999) “The use of forging simulations tools” Advanced Technology of Plasticity, v. 3. pp. 19-24. 8. Wagoner, R. H. and Chenot, J.-L. (2001) “Metal Forming Analysis” Cambridge University Press, Cambridge, UK. 9. Li, G., Jinn, J. T. Wu, W. T. and Oh, S. I. (2001) „Recent development and applications of three-dimensional finite element modelling in bulk forming processes“ Journal of Materials Processing Technology, v. 113. p. 40-45. 10. Altan, T., Ngaile, G. and Shen, G. (2004) “Cold and hot forging” ASM Publisher, Materials Park, Ohio. 12. Tisza, M., Lukács, Zs., Hál, G.: “Numerical Modelling of Hot Forming Processes”, 3rd International Conference on Thermal Process Modelling and Simulation, Budapest, 25-28. April 2006. Proceedings of IFHTS 2006. (2006) pp. 3-14.
received his MSc degree in mechanical engineering at the Technical University of Heavy Industry in 1972. He received his PhD degree also in mechanical engineering in 1977. Then he got a CSc scientific degree from the Hungarian Academy of Sciences in 1981 and the highest academic degree DSc in 1995, these latest two degrees in materials sciences and technology. He is presently a full professor at the University of Miskolc, and the director of the Institute of Materials Science and Technology. received his MSc degree in mechanical engineering at the University of Miskolc, in 2001. He received his PhD degree also in mechanical engineering in 2014. He is presently a senior lecturer at the University of Miskolc, Institute of Materials Science and Technology. His research area is Modelling of Metal Forming. received his MSc degree in mechanical engineering at the Technical University of Heavy Industry in 1969. He received his university doctor degree also in mechanical engineering in 1987. He is presently an associate professor at the University of Miskolc, in the Institute of Materials Science and Technology. His research area is Sheet Metal Forming including Processes & Die Design.